– I'm interested in the intersection of art and science. Freezing time, telling stories, creating and preserving beauty for people to enjoy now, over and over, is incredibly intoxicating. – I often get inspiration from other photographers, known and unknown. Film and music are other sources of inspiration, as is the everyday life, as I try to create beauty from the simplest settings. 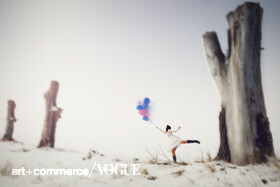 – Fashion, portraiture and landscape, preferably in combination, is what gets my creativity going. – I have a broad selection of favourite photographers from Anton Corbijn to Mario Testino, Emily Soto, Melissa Rodwell and Camilla �krans.